We are thrilled to discuss our new book, America’s First Daughter, which portrays the relationship between Martha “Patsy” Jefferson Randolph and her famous father, Thomas Jefferson, and explores the sacrifices Patsy made and the lies she told to protect him, his legacy, and the new nation he founded. Now, when you’re writing historical fiction about real people, accuracy is important. But real people’s lives seldom fall into a neat narrative arc. Large portions of a person’s life are spent waiting, frustrated, mired down with meaningless coincidences. Can you imagine reading a book about a gun on the mantelpiece that not only never goes off…but was put there by accident by some character who never appears again in the novel at all? That’s the sort of thing that happens in real life–but nobody wants to read about it! Truly, half the challenge of a good historical fiction writer is to wrestle the biography into a structure that at least vaguely approximates the hero’s journey. Fortunately for us, the life of Patsy Jefferson was already a sweeping epic with a natural rise and fall…and rise again. But that didn’t mean we weren’t forced to take a few liberties, and though we confessed our sins in our author’s note, we thought it would be fun to more fully expose the lies we told in pursuit of good storytelling! 1) We sometimes put our heroine where we knew she wasn’t. The historical record indicates that Patsy Jefferson wasn’t actually by her mother’s bedside when she died; for that matter, there’s a bit of ambiguity about whether Jefferson himself was there at the moment she took her last breath. But there’s no denying that Martha Jefferson’s death was dramatic (as recounted by Edmund Bacon, who described a deathbed scene.) It was also the formative experience that shaped Patsy’s life. And because the book is written in first person, that would mean that if Patsy wasn’t there to see it, the reader wouldn’t be able to see it either. No good writer wants to do that to their readers, so we slipped Patsy in somewhere unobtrusive, where she wouldn’t be noticed, and let her describe the scene with all the historical details we know. 2) We said things happened where they didn’t happen. Imagine that you had to build a stage setting for every place anything important ever happened to you. Now imagine that as many important things happened to you as happened to the Jefferson family. That’s a lot of stage sets to build, and that adds a lot of length to a book. So whenever possible, we tried not to add a new setting. Patsy Jefferson and her sisters were inoculated for smallpox on an isolated farm but we put them at Monticello. Patsy’s son Jeff was carried to his wife’s home following his stabbing, but we put him at Monticello too. And hardly anyone was the wiser until this blog post! 3) We said Patsy ferreted out a spy. A lot of interesting things happened to the Jeffersons when they were in Paris–including, but not limited to, the British government’s apparent attempt to place a spy in our embassy under Jefferson’s nose. No one knows exactly how Jefferson came to be suspicious of the spy in his midst, which is exactly the sort of mystery that a historical fiction author loves. Given all the things we knew about the historical Patsy Jefferson–namely that she was intimately involved in her father’s life to a degree seldom seen even in a daughter, that she was described as very intelligent, that her letters reveal her to be observant about people’s character–it seemed natural that she would be the one to have both the suspicion and the opportunity to discover a spy in her father’s embassy. What’s more, we knew that the British ambassador subsequently singled out Jefferson’s daughter for his attention, probably for political reasons, so our heroine was deeply involved in matters of state. So that’s what we went with! 4) We made one of the Randolph sisters into a killer. The Scandal at Bizarre Plantation that dragged Patsy and her family into court in an infamous murder case is, to this day, an unsolved crime. But novelists are supposed to come up with a theory, to pick a side and present a plausible scenario, and that’s just what we did. We won’t say which sister we really think did it; you’ll have to read the book to find out! 5) We Made Colonel Randolph Into a Nasty Villain. There really isn’t much in the historical record about this man, but Patsy’s father-in-law caused her a lot of trouble. We know that his daughters fled his household when he remarried. We know that he deprived Patsy and her husband of their expected inheritance. And amongst all Jefferson’s correspondence, a letter to Colonel Randolph is amongst the most pointed and heated. Given that Jefferson was usually so mild-tempered, one can only imagine what sort of character Colonel Randolph was to agitate him so. And that’s exactly what we did. Looking over all the anecdotes and documentation we could find, we imagined what sort of man Colonel Randolph might have been. Extrapolating character from actions and consequences, we decided on villainy, because that’s what good writers do! 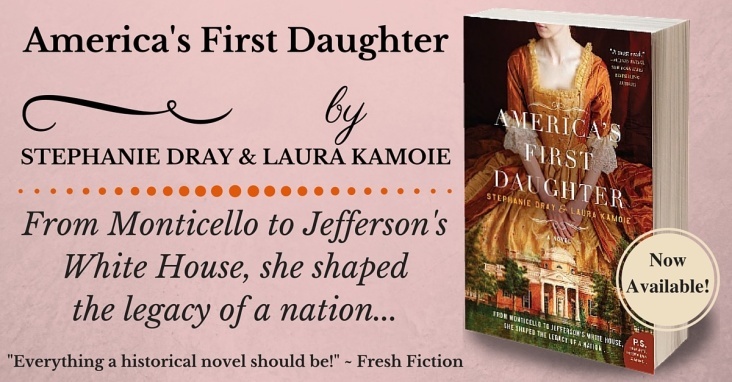 So now you know some of the lies we told and why, but most of the outrageous things that happen in America’s First Daughter are actually true! ← Map of America’s First Daughter Sightings!